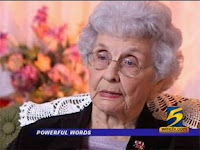 92-year-old Pauline Jacobi reads her Bible everyday. Her strong faith keeps her going in life and may have saved it after she almost became the victim of a parking lot robbery. Jacobi had just finished putting her groceries inside her car at a Dyersburg Wal-Mart when a man jumped into the car through the passenger's side door. He told Jacobi he had a gun and that he would shoot her if she didn't give him money. "I'm not going to give you my money," Jacobi said. In fact. She told him "no" three times. Then she started to talk to him. "As quick as you kill me I'll go to heaven and you'll go to hell," Jacobi said she told the man. "'Jesus is in this car and he goes with me everywhere I go." "He just looked around and the tears just began coming down his eyes." She told him to ask God for forgiveness and ministered to him for 10 minutes inside her car. "He says, 'I think I'll go home and pray tonight,'" Jacobi said. "I says, 'You don't have to wait until tonight. You can pray anytime you want to.'" As tears were rolling down the man's face, Jacobi voluntarily gave him $10. All the money she had. "When I told him I was going to give him the money, I said, 'Don't you go spend it on whiskey either,'" Jacobi said. The man thanked her for the money and kissed her on the cheek. Then he walked away. He told Jacobi his name was Ricky and he was from Halls, Tennessee. She doesn't want to see him in jail, but also doesn't want him to hurt anybody. However, police do want to see him in jail and are asking for help. If you have any information, call Dyer County CrimeStoppers at (731) 285-TIPS.